Something in politics shifted the day after my visit to Moving Nations, a new group show of works by young artists personally reflecting on displacement and nationhood, brought together by curator Grace Partridge under the banner of Antidote. A decades-long stalemate in the imprisonment and abuse of asylum seekers finally ruptured, with the country’s largest ever human rights case resulting in the Federal Government and contractors committing to direct $70million in compensation to over 1,900 former Manus Island detainees. The landmark out-of-court agreement marked a rare moment of progress in a domestic political situation often blighted by voter cynicism and bipartisan incompetence. After all, the refugee issue has come to define Australia’s very status as a fearful, anxious country, and a stranger to its own history of migration, from convict settlement to waves of newcomers prompted by gold rushes and wars, to the more recent internal shifts in the cities as housing prices and gentrification bear down. Moving Nations is like a small collection of migratory portraits, contemplating the lives of asylum seekers directly in Penny Ryan’s Open Hearts (2016), a participatory installation that invites audience members, in a simple gesture of solidarity, to unwrap a sculpture of a terracotta human heart, one for each aspiring Australian in offshore detention. Moving Nations goes beyond the specifics of mandatory detention, toward a broader sense of splintering displacement. 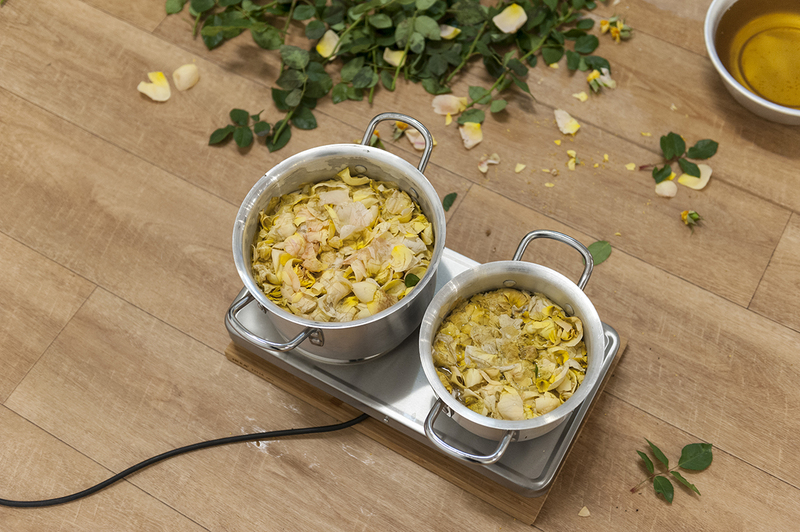 This idea is neatly realised in Justine Youssef’s An Other’s wurud (2017), an installation documenting a performance in which the artist makes traditional Arab rosewater in the gallery. On the floor lies a scattered carpet of drying rose stems alongside a portable stove, saucepans, lids, a steel colander of damp petals and three large glass bottles of the precious liquid. Though Youssef has faithfully followed her grandmother’s recipe, she has used the locally available English David Austin rose in place of the traditional Damask rose. It’s a lovely metaphor for the contradiction between the place where you’ve pragmatically found yourself and the heritage that shaped your arrival. The work strikes the right balance between conceptual sophistication and sensory impact, as the delicate, floral aroma of roses hovers in space. Though much installation art can feel cold and alienating — indifferent to being understood by and affecting the audience member — Youssef appeals directly to the sense of smell, making the work come alive even for those like me who missed the performed element. Eugenia Lim’s Yellow Peril, excerpted from a series (2015; read the RealTime review), also finds ways to deftly express large-scale metaphors using simple materials. 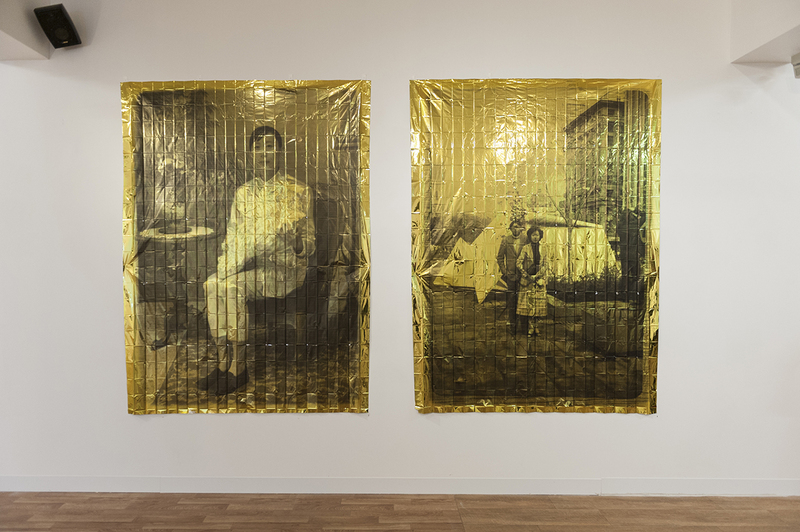 Appropriating the visual language of portraiture, Lim has printed two huge photographs in greyscale on gold, unfolded mylar emergency blankets. On the left is Lim herself in a photo styled as if salvaged from the era of the Victorian Gold Rush that brought many Chinese people to Australia. Seated and placid, she holds a large gold nugget. On the right are her parents on their arrival in Melbourne in the 1980s. Despite their big-picture dazzle, the two images evoke a genuine melancholy, the work a captivating and original contemporary take on 19th and 20th century portraiture conventions, connecting Lim’s family’s relatively recent migration within the longer continuum of Chinese people in Australia. Abdul Abdullah’s the lies we tell to help us sleep (2015) and Olga Cironis’ together we were rich, we had shoes (2013), continue the theme of reclaimed portraiture that reflects the experience of diaspora. Abdullah’s digital photograph is visually arresting in its composition and lighting, but requires a little more context to help the viewer unlock the obviously rich symbolism contained within. Cironis takes an archival family photograph, digitises it and blows it up alongside a second panel of deep shiny black, suggesting a violent and total erasure. James Nguyen’s Adidas/Converse (2017), in which those words are overlayed in neon signage, neatly points to the ways that the Vietnamese economy relies hugely on sneaker production, and beyond that, the dependent relationship between the developed and developing worlds and the resulting pathways through which migration is triggered. Less lateral, but counterpointing the show’s other viewpoints with an Indigenous perspective, is a video work, Right Land’s (2015) by Dean Cross, documenting the artist walking along the perimeter of his family property: a delineation of arbitrary boundaries imposed on Aboriginal land. Spotlighting complementary cultural experiences, Moving Nations considers Australia’s unfolding migratory history with curatorial clarity. The show sets aside a singular notion of Australian nationhood for something messier and closer to home. As a small ARI show, it also marks an interesting grassroots counterpoint to the new biennial initiative presented by the MCA, AGNSW and Carriageworks, called The National. The vision presented in Moving Nations is far more refracted than the one encapsulated in the loaded word ‘national’ and the grand, implied association of a single Australian identity that goes with it. Perhaps the more useful uniting concept simmering beneath these works is a simple desire to belong to and understand our history.